Batteries arrived ok and working fine. aucune surprise désagréable ! content du produit livré en temps et en heure,fonctionne parfaitement .... pour l'instant , à suivre . Excellent value. Item was delivered to an Argos store for collection but was sent without a reference. Made the pick up tricky! Cannot fault the service or delivery of the item. Only used the battery half a dozen times since purchasing, but it does the job well enough, and charges in a fraction of the time the old type battery used to. 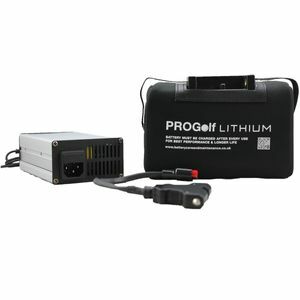 At the moment I am very pleased with the battery it's so light and pushes my heavy golf bag around my golf course with ease and it takes very little time to charge it. If it is still doing the business in a few years time then I have won a watch. So we will wait and see what transpires. Service and item was and is excellent . Excellent customer service from Tayne as original battery choice was not available. Very quick delivery. Have used battery twice and very pleased - so much lighter to handle with fast charging. Sorry I didn`t convert to lithium earlier! So far so good! Battery has a 5 year warranty so I'll let you know after 5 years? Unusual the fact that the charger only has a 2 year warranty! In which case I might need 2 chargers to last me the life of the battery? I was also surprised by the noise from chargers loud fan! Smaller and much lighter than most batteries I have used but with a big heart. I play on a very hilly course with a heavy bag and have no problems at all. Charging is noisy due to a fan in the charger unit but this stops when battery charged. Not yet tried on 27/36 holes (hence could not yet put 5 stars) but feel confident it would easily cope with 27. Looking forward to Wayfarers day - 9 then 18 holes. As far as the battery goes it is working great charges really quick compared to the old lead battery and gets me round the golf course with ease. Would definitely use Tayna batteries again but hope it is a few years down the line.